We come in peace! Well, maybe those Martians didn’t, but the Funko Pop Mars Attacks figures do. The set depicts the notorious aliens from the sci-fi film. 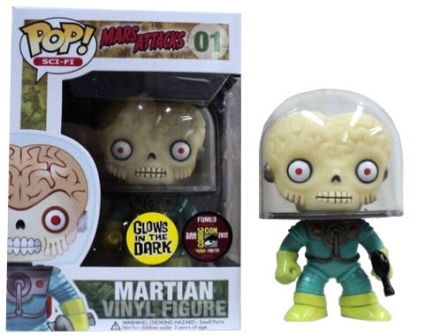 Fittingly, Funko Pop Mars Attacks is the first vinyl figure issued in the main Pop! Sci-Fi line. The Martian perfectly reflects the big-screen aliens as he stands with a glass helmet protecting his exposed brain and oversized eyes. The alien figure wears a green suit, yellow gloves and holds a ray gun. Additionally, fans can find two Martian variants. 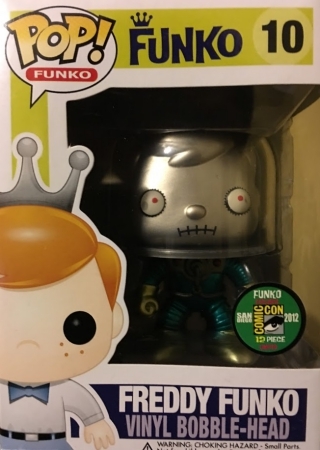 Originally released at the 2012 San Diego Comic-Con, collectors should be aware that only 480 of both the glow-in-the-dark and metallic versions were produced. 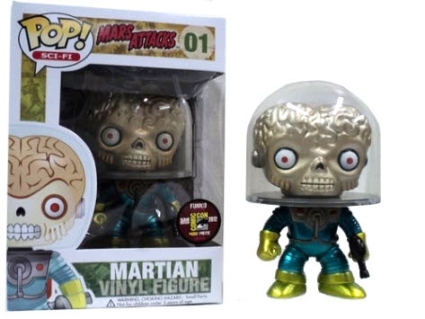 Shop for Pop Mars Attacks Figures on Amazon. 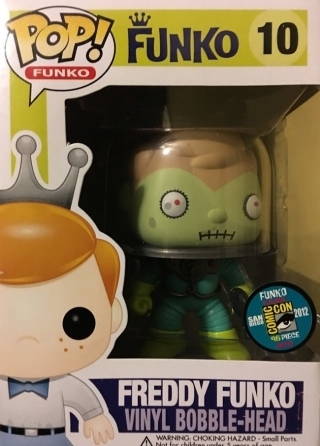 While he isn’t officially part of the Funko Pop Mars Attacks lineup, Freddy Funko as Martian also debuted at the 2012 SDCC. The main option is limited to 96 figures, while the metallic figure has a production total of just 12 pieces. Based on the 1962 Topps trading card set of the same name, Tim Burton’s Mars Attacks! chronicles a sequence of events after dozens of spaceships have landed on Earth. The film boasts an epic Hollywood ensemble including Jack Nicholson, Glenn Close, Sarah Jessica Parker, Michael J. Fox, Lukas Haas and Natalie Portman, just to name a few. Despite this, it is, of course, the CGI aliens that take center stage. Can’t get enough Mars Attacks!? Don’t worry, we’ve got you covered. Check out the 1996 Topps Widevision Trading Cards or the 2017 Topps Mars Attacks Revenge Trading Cards. 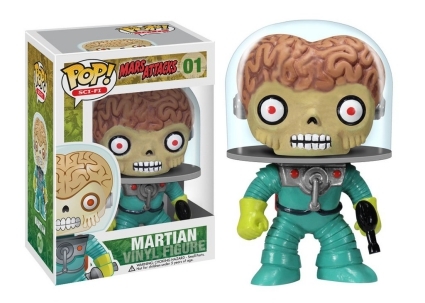 There is even a 2014 Funko Mars Attacks Mystery Mini figure of the alien, who happens to have tough odds (1:72 boxes)!